An ever-popular cocktail made with Cointreau, vodka, cranberry juice and fresh lime. A frozen daiquiri cocktail made with wild strawberry liqueur and fresh strawberries. This classic British favourite was created by Fanny Craddock and was the height of sophistication in the '70s and '80s. However, done right, it still has a lot of cachet even today. Especially designed and created by our resident mixologist Jack, our signature cocktail is made with pear vodka, a home made basil sugar syrup and strawberry puree topped with freshly cracked black pepper. Pan fried tiger prawns and scallops served with Avocados, shredded baby gem and a Chobani Marie Rose sauce. Pan fried tiger prawns and scallops served with Avocados, shredded baby gem and a classic Marie Rose sauce. A summery dessert inspired aromatic cocktail that can easily be whipped up at home. 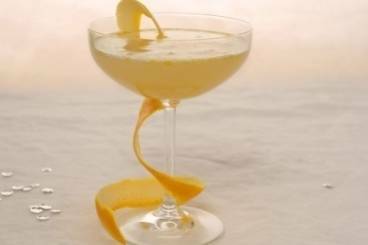 A sparkling cocktail perfect for special occasions - Champagne with orange and a splash of Grand Marnier liqueur.